PORT MOODY, BC – A new independent brewing project from the head brewer of Twin Sails Brewing has released – and sold out – its first limited edition beer. 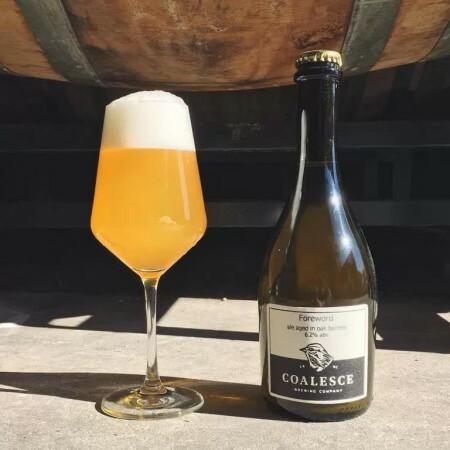 Coalesce Brewing has been established by Ryan Voigt to brew mixed fermentation and wood aged beers out of the Twin Sails facility in Port Moody. Foreword is a mixed fermentation ale inspired by the historical saison style. Foreword was brewed with oats, spelt malt and raw wheat and hopped judiciously with Hallertau Hersbrucker and Saaz. The beer was fermented dry with a mixed culture of Saccharomyces, Brettanomyces and Lactobacillus in freshly emptied BC Chardonnay barrels, where it rested for 3 months until mature. It was then refermented and conditioned naturally in the bottle for an additional 3 months. Limited to just 45 cases of 500 ml bottles, Foreward went on sale at Twin Sails on Saturday, and sold out within two days of its release. For more details and announcements of future releases, see the Coalesce Brewing Instagram feed.